Explore las comunidades andinas y las antiguas ruinas incas en el campo fuera de Cuzco durante esta aventura a caballo de 4 horas. Aprenda sobre la vida y los ritmos de la vida local, observando las técnicas agrícolas junto con los ganados de alpacas y ovejas mientras pasa por estos pequeños municipios. También podrá descubrir los templos incas, sumergirse en la energía ancestral de estos lugares de interés espiritual, y visitar el "Balcón del diablo ", una cueva natural utilizada como santuario Inca. 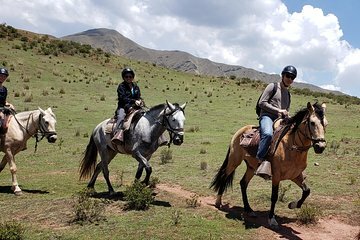 Su paseo a caballo cerca de Cusco también incluye un guía, el equipo de equitación, aperitivos, agua y transporte de ida y vuelta entre su hotel y el rancho donde podrá comenzar su excursión. Descubra los ritmos diarios de la vida en los pequeños pueblos fuera de Cusco. Explora la energía espiritual de los antiguos templos y santuarios incas. Incluye transporte de ida y vuelta del hotel al rancho de cabalgatas desde Cusco. Great time, professional staff and our guide was practically a native English speaker. Great experience a lot more that we were expecting the Tour guide was amazing and very knowledgeable. This trip was a major disappointment! I choose this particular tour because it indicated that the duration was 6 hours, longer than any others. We were scheduled to start at 1:00 pm, pickup at 12:30 The day before I received an e-mail notifying us to be ready for pick up at 1:30, already short an hour. We started at 2:00, and were back by 4:00. There was very little riding as we dismounted twice to view some ruins. The guide was polite and knowledgeable, but seemed more interested in a big group that was coming in the next day than in us. The horses were not especially well trained. If Viator wants to maintain its credibility, it needs to discuss the issue of how long the trip is to be or drop this vendor. We were driven by private car to where the horses were, and met the tour guide. He was great and talked to us along the trail. We also stopped for a picnic he prepared. Overall this was a great private tour. We only went to 2 of the 4 locations: the Temple of the Moon and near Devil's Balcony, which, according to our guide, was closed. On arrival the guide said we were going to Sacsayhuaman, but I insisted on the paid for itinerary. His English was limited and there was no instruction. Use a company. If could on do one thing during your stay in Cusco I would choose this. Having never ridden before, I got on very well with my horse Sol - even getting up to a gallop. The scenery was absolutely stunning and exploring Devil's balcony on foot was breathtaking. The guide was friendly and very knowledgable, my favourite day I spent in Cusc - do it. We really enjoyed our horseback riding tour. It was a great way to spend the morning while acclimating! We learned a lot about the area from our wonderful guide and did some hiking as well. I would highly recommend this as a way to spend a half day outside of Cusco. We loved our trip with Jorge. He was very well informed about the area as he has lived his life here. He was pleasant, concerned about our wishes and a fun person to spend the day with. He took us to sites the general public does not see and was very attentive to us riding as we are not expiernced horsemen. I would definitely book this tour again if we ever have the chance to come back.